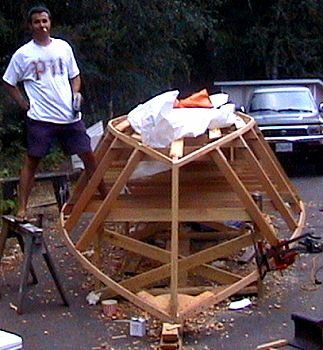 I have built this Little Hunk Dory from the plans I purchased from Glen-L Marine. 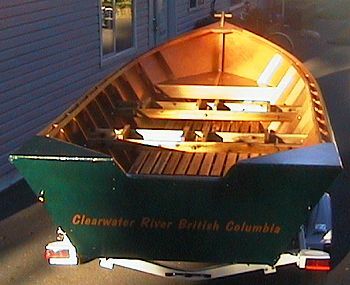 The boat was built outside next to the Clearwater River during the forest fires that ravaged the area here this summer. Her name is Nervous Water. She will not be launched until spring, due to engine costs and lack of funds. I plan to power her with a 4 stroke 60hp jet. I feather joined all the plywood. 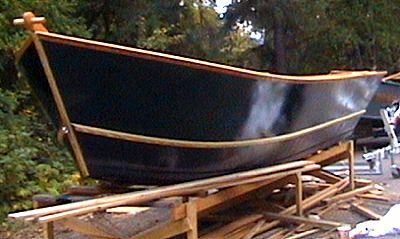 The ribs and chine's are made with old growth edge grain fir, and the inside was finished with cedar floor boards and cedar framed, rope woven seats, to reduce weight. I used kevlar cloth to cover the bottom and 6 cm of the side. The kevlar was very easy to wet out compared to glass cloth. I am very exited for spring to arrive and to launch Nervous Waters. 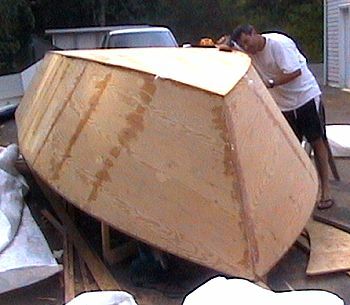 Thanks Glen-L for the boat plans and your web site. The project was fun and I look forward to building another Glen-L design in the future.